He challenged ‘The Boss’ in the ice floes of Antarctica. in Antarctica, leaving him and his crew of 27 stranded. agr﻿eed to be the most astonishing voyage of survival in history. Ellis Jones, for many years has been a senior director at the Royal Academy of Dramatic Art, one of the world’s most celebrated acting schools, has supervised the training of many of today’s most exciting actors. He was RADA’s Head of Acting from 1993 to 2003, the Academy’s Vice-Principal from 1998 to 2003, and more recently has been Creative Director of RADA’s Enterprise Company, producing educational and corporate projects in the UK and abroad. Ellis is the author of “Teach Yourself Acting” (Hodder Headline 1998). 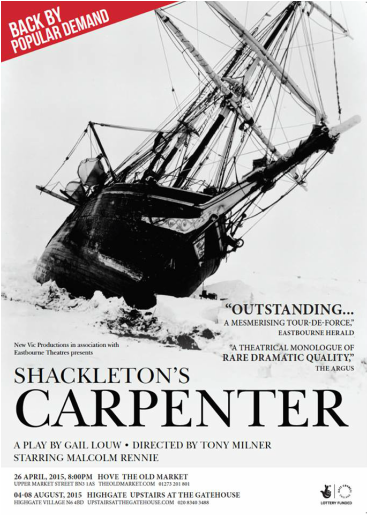 Malcolm Rennie – think lovely character work in “Mr Selfridge”, in “Pride and Prejudice” and lots of other shows – and then look out for “Shackleton’s Carpenter”, a cracking one-man play currently on tour. Gail Louw has written a tight, witty and moving script about a key figure in one of the great exploits in the history of antarctic exploring, whom we discover as an abandoned derelict on the wharf at Wellington, New Zealand. If you’re interested in what British class attitudes meant (and often still mean) then here’s a telling and disturbing true story. If you’re interested in acting, then go and learn from Malcom’s command of the stage, his assured and thrilling vocal skill – and above all for his painstaking exploration of every nuance of the script and the situation it portrays. Masterly work." alone and destitute on the wharfs of Wellington, New Zealand? the Brighton Fringe Festival 2014. This latest production stars renowned actor Malcolm Rennie, who recently appeared in the ITV series Mr Selfridge.